Dear readers, I do not claim paternity of this title; in fact I think it was initally the developers of Claws Mail who had coined that line, precisely as a prank on the Evolution hackers. Today however I wanted to review the Evolution client and my experience with it, especially in the light of my extensive use of Claws Mail (and to a lesser extent, Thunderbird). Just before we start, however, I just would like to underline that I’m not forgetting my adventures with email clients on Emacs. Expect a post on this topic later this month. I recently acquired a new laptop and decided to install my favorite Linux distribution, Arch Linux. Without looking for excuses, I guess I lacked time and I got the partitions wrong . As it turned out, I had a live Fedora 21 that I was trying and decided at least as a temporary solution, to fully install. The install was a breeze but that is not exactly what I wanted to talk about. When the time to choose an email client came up, I did not opt for my beloved Claws-Mail, but went for the default Gnome Mail client, Evolution. What did change and did this choice work for me? Some readers may remember an article I wrote last year about potential choices for email clients and another one about technical considerations to move to an Emacs-based email client. Both will be useful for background. However, some of these requirements and criteria have changed. As it were I have no more need for POP access, and I could go for a full Maildir inbox storage (instead of one based mostly on MH). Besides this I have now started to use shared online calendar on a daily basis. These three changes are actually broadening both my considerations on emacs client, but do lead me to change my expectations on graphical clients as well. I have been writing it here and elsewhere several times and will do it again: Claws Mail rocks. It seriously does. If you don’t need to use shared calendar, that is. Claws Mail does ship with a calendar plugin that anyone with a limited use of anything like a Google Calendar or a local calendar can more or less rely on. I have satisfied myself with that, as my previous work and activities were not requiring to share 20 different events or meetings all day long. 21st century families can use several shared calendars, and not all of them are on Google. In 2013, my work with one client demanded that I use a corporate shared calendar with an entire team of co-workers. I had restarted to use Evolution on a limited basis but felt very happy with it as well. I now use our calendars and sync them across devices, but I no longer use Google Calendars: I use the KolabNow (aka My Kolab) online service for my personal email, contacts and calendars. I can use the CalDav and CardDav standards to sync and share calendars across devices. Now, Claws uses the webcal protocol in a rather buggy way, but it certainly does not support CalDav nor CardDav. I would love to reconsider my options should this change. On the email front, things have changed as well. I no longer use email providers allowing POP access only; either because they are now offering IMAP access or because I no longer use them. Of course Claws Mail supports IMAP really well, but there’s an interesting side note to this: One of the things that makes Claws Mail outshine every other client out there is precisely the blazing speed at which it handles MH inboxes with POP accounts. IMAP accounts are handled differently, albeit not in altogether uncommon way by Claws: these are still MH inboxes you can choose to save on your hard drive periodically. However, the IMAP & SMTP protocols cannot usually be as fast when you’re receiving or sending emails, because of the constant connection to the server. This does not make Claws a slow email client: in fact it is still very fast, but it makes Claws lose its significant edge compared to others, especially Thunderbird. Evolution has changed compared to its previous lives in the form of the 1.x and 2.x branches. Evolution however is the Swiss Army knife of email: while it is not lightweight like Claws, it is actually less demanding than Thunderbird. Picture this: Evolution takes less memory than Thunderbird when loaded with three IMAP inboxes (one with 4 Gigaoctets-large, the second one 2 Giga, and the third one 250 Mo), one MH-based mail archive of 1 Go; 2 shared calendars and a full address book; Thunderbird takes more space without any plugin (without the calendar for instance) and only these three IMAP accounts loaded. The difference ends up being between a stable and running system (running Evolution) and a system choking off running Thunderbird. But let’s move on to Evolution proper. IMAP Data migration is a breez with Evolution; calendars were a bit trickier, in that you will get random error messages that actually do not mean what they say; you can access your calendars and yes, your shared calendars are all there. You need to restart Evolution for the calendars to display the first time however. Contacts are also very easy to import. There is even an assistant to run mailings in conjunction with LibreOffice. One thing I don’t like is that Gnome Themes do not seem to agree well with Evolution. At least not all of them: depending on your GTK+ theme or your Gnome Shell look, certain areas of Evolution may all of a sudden become oversized. One thing that tends to surprise me is that very few people customize the fonts of their email client; any client allows for this and more specifically different fonts for the messages that are read on screen and different fonts for the rest of the interface: messages list, menus and inboxes lists. As such as have found some nice fonts for message reading (Carlito) but not somuch for the message list. Be it as it may, message handling such as reading, editing and sending on Evolution feels very smooth. You even have advanced editing capabilities for html messages (I realize I’m writing this, the guy who talks about Claws all the time) which may be handy for some people. Another matter of importance is the search and filtering capabilities of each client. Here I must say that Claws “does it better” than Evolution. When it comes to search a similar explanation should be made about Claws: whenever Claws has to search a local inbox, I would go as far as saying that only NotMuch goes faster (but then it’s technically not an email client). 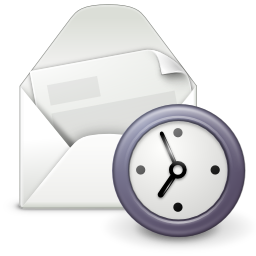 Searching IMAP folders will taker more time, but it is nonetheless fast. Evolution is fast as well, but there is somewhat of a difference. Filtering is well made in Claws, while I read every kind of horror stories about filters in Evolution. It may be because people tend to forget that filters may end up having a mutual effect that they don’t always foresee: if one filters performs a specific action, it may filter emails that ought to be filtered in a specific way (i.e put in a different folder) by the second filter so that running the two filters will really mean that the first filter works entirely but not the second one. Evolution’s filters assistant seems less intuitive in that regard. Intuitive menus and assistants are another topic; really I’d say that this is up to each user to decide, but the two clients offer an inordinate number of refinements through their maze of menus and preferences settings that accomodate someone like me who receives probably over 150 emails a day (and much more at times) and is subscribed to about 50 mailing lists across several accounts. Mailing lists management is very well handled by these two. Last but not least GPG keys handling is just as smooth as with Enigmail in Thunderbird. All in all, I have not dumped Claws, as I use it on my workstation; but there are chances that it will be phased out sometimes this year unless support for CalDav starts to be added. However the question of whether I should rather switch to Emacs has not been answered yet; and I won’t answer it here and now. It’s a developing story for me, but I hope I have been able to share my experiences on these topics. They matter more than we think and the answer cannot only be either Thunderbird or Gmail! 6 Responses to "In praise of Evolution and Intelligent Design"
Nice report – tried it myself with evolution (before TB) while i had a dualboot. Totally agree, OwnCloud Calenders worked as well. Was great. Maybe i give it a try on Windows…. But is it available on Windows? As a regular reader I can only say: I’m hooked. Regarding the rest of the post: who doesn’t have a browser open all day long nowadays? Who doesn’t? Thanks for your comment! I am in the process of stopping most of my Google services for privacy concerns. Therefore I do not rely on these for pretty much anything.